• Second Weekly Gain. U.S. stocks finished mixed last Friday with the S&P 500 breaking a three-day rally, as declines in technology mega caps weighed on sentiment amid quarterly rebalancing and quadruple witching, when futures and options on indexes and stocks expire. More than 10 billion shares traded hands on Friday, 64% above the three-month average. World stocks were upbeat for the week amid widespread optimism that trade tensions will ultimately be contained or prove insufficient to curtail the global economic recovery. • Weekly Performance. For the week, the S&P 500 gained 0.86%, the Dow Industrials advanced 2.25%, and the tech-heavy Nasdaq Composite fell 0.28%. The S&P 500 reached a new record high on Thursday (2,930) and posted a second weekly gain, its fifth winning period in the past six weeks. • Raw Material Producers Performed Best. Eight of the 11 major sectors advanced for the week, with Materials (+2.33%), Financials (+2.27%) and Energy (+1.92%) up the most. Utilities (-1.47%), Real Estate (-0.35%) and Technology (-0.04%) lagged. • Treasurys Weakened Last Week. Treasurys were unchanged on Friday, while overall prices declined last week, sending the yield on benchmark 10-year notes up 6.7 basis to end the week at 3.064%. The U.S. Dollar Index climbed Friday, but capped the week down 0.75% at 94.220. Meanwhile, the Bloomberg Commodity Index gained 2.40% last week, reaching its highest level in a month. U.S. crude oil rallied 2.92% last week, ending at $70.78/barrel, a four-year high. Friday, September 28: Personal Income & Spending, Consumer Sentiment, Core Inflation. The Conference Board Leading Economic Index (LEI) increased by a modest 0.4% in August, pushing the year-over-year (YoY) increase to 6.4%. 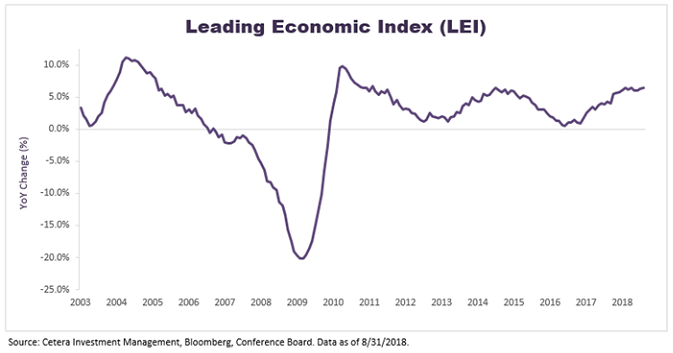 The LEI, which is an aggregate of several leading economic indicators, has been trending higher since early 2016 and the current reading is signaling sustained growth in the months ahead. This indicator has been positive YoY for 105 straight months, nearly the entire length of the current economic expansion. The LEI has been a reliable indicator historically in gauging the future path of the economy. This indicator rises ahead of economic strength and falls ahead of economic weakness. The LEI peaked an average of 12 months ahead of the last six recessions. At this time, the LEI remains strong, and we anticipate robust economic growth through year-end.